Ashton. Britney. Hugo. Chavez Aims To Be The Most Followed Twitter User. Maybe you haven’t noticed, but there’s a serious race going on once again for the right to be Twitter most-followed user. Ever since actor Ashton Kutcher beat CNN to the one million mark, he’s been in the lead — and now has some 4.8 million followers. But pop star Britney Spears is quickly catching up, with nearly 4.8 million herself. So the race to 5 million is on. But if one revoluationary has his way, those two will have company at the top. 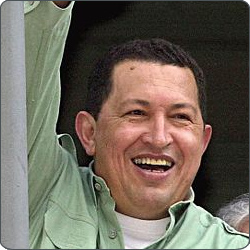 Hugo Chavez, the President of Venezuela, has announced his intention to join Twitter . Considering that Chavez reguarly writes a newspaper column, and has his own radio show, the fact that he would use this newer mass communication medium isn’t that surprising. But what is surprising is his apparent goal. “I’m sure he’ll break records for numbers of followers,” Diosdado Cabello, Venezuela’s head of communications told Bloomberg today. From 0 to 5 million — that’s going to be one hell of a task for someone who is not exactly a pop icon. I’ve never seen anyone gain followers as fast as Conan O’Brien, and even he has “only” 888,000 followers almost exactly two months after he joined the service. Bill Gates, another shooting star, has only 775,000 followers. Since the destruction of the Suggested User List, it’s pretty hard to gain the number of people it would take to get anywhere near Kutcher and Spears (who were both on the SUL previously). As the Bloomberg article notes, Chavez will join other world leaders such as the U.S. President Barack Obama (who has 3.8 million followers), Chilean President Sebastian Pinera (who has 88,000 followers), and Israeli Prime Minister Benjamin Netanyahu (who has 3,500 followers). Meanwhile, Chavez’s mentor, Fidel Castro, also has a little-known Twitter account of his own — sort of. The account, found here is apparently run by a newspaper and tweets every time Castro has a new article. This is quite a turn of events for Chavez as it was just February when it was reported that he was trying to silence his critics that were using Facebook and Twitter to call for his resignation (he denied the charge). According to this site, the hashtag #freevenezuela was the third most common terms used on the Twitter at the time.